The BBC and BBC Worldwide have created a fan-powered social campaign to celebrate the 50th anniversary episode of Doctor Who, called #Savetheday. Created by ZAG, the consultancy arm of ad agency BBH, the digitally-led off-air campaign aims to harness the excitement and creativity of Doctor Who fans across the globe in the run up to the anniversary show, which will air on 23rd November. 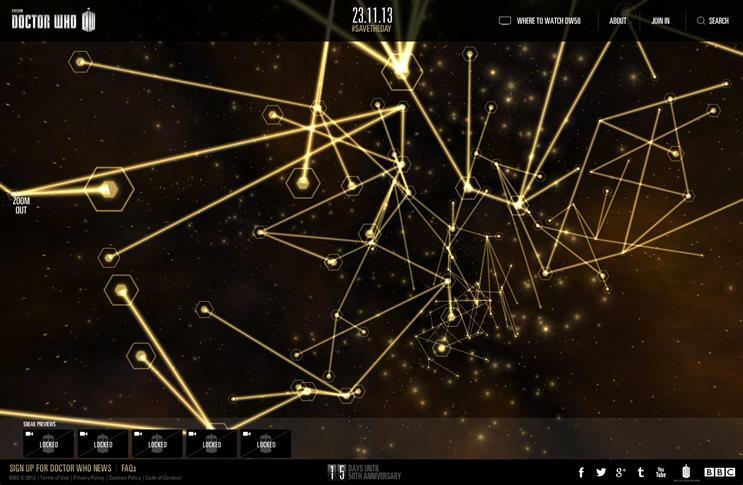 A dedicated site houses an interactive TARDIS that acts as a hub for fans to show their support for the Doctor. The site shows a 3D, spinning golden version of the time machine that lets fans explore content being tagged online with #SaveTheDay, while people can use the hashtag to add their own content to the mix through Facebook, Twitter and Instagram. The work is supported by on-air trails on BBC One, developed by Red Bee Media. The episode will be broadcast on BBC One on Saturday 23rd November, and will air in over 75 countries and in hundreds of cinemas across the globe. Kerry Moss, acting head of marketing at BBC One, said: "In the weeks leading up to the broadcast of the show’s special episode on BBC One and around the world, the site will showcase and celebrate the passion and amazing creativity of Doctor Who fans".